I believe in the Constitution of the United States. I don’t think it’s outdated, but I think it could use some additions and clarifications. Fortunately, the Constitution’s framers provided a means for the States not simply to suggest further amendments, but to make them. Gathering a Convention of States for that purpose is a long, tedious process, but a large number of concerned citizens are attempting to do that now. I haven’t paid as much attention to their news as I might have done, but I believe their proposed amendments are good and necessary. I’m not going to talk about their proposed amendments as such, even though some of mine overlap with theirs. Let’s start with a requirement that Congress pass a balanced budget every year. We’ve all heard horrendous stories about the way the Federal government wastes money. And I believe billions of dollars are spent by the Federal government on areas the Constitution doesn’t give it the authority to be involved in. Many of them–education, for example–should be strictly within the hands of the States. Oh, and let’s set term limits–the total number of years–senators and congressmen can serve in public office. No one should be permitted to make a career of staying in office. That’s probably a big factor in why the swamp in Washington needs to be drained. And why it’s so difficult to do. And what about those Supreme Court justices who have more power than Congress, even though the framers of the Constitution intended for the judicial branch of the government to be the weakest branch? And it’s almost impossible to remove a justice. Their power needs to be limited, and perhaps they should be given term limits as well. I don’t know whether they should be elected, but it’s a thought. Of course, if their power was properly limited, that probably wouldn’t be as much of an issue. I don’t have an answer for the immigration problem, but if I were someone who’d worked hard to gain legal entry into the United States and did so because I loved what America stands for and studied and and passed the test to become an American citizen, I would be highly upset at the influx of illegals, many of whom don’t want to blend in with the rest of us. Maybe we can’t force them to change their attitudes, but the Constitution could be amended to make English the official–the ONLY official language–of America. I’m not out to make people forget their former cultures, just to make English-speaking Americans out of them. And not bow down to their anti-American attitudes while enjoying America’s privileges. And while I’m at it, how about an amendment clarifying that the First Amendment doesn’t outlaw religion in government? It only says that the government can’t establish a state religion. Hmm. I thought I was done, but one more thought has come to mind. Maybe the Constitution can’t be amended simply to outlaw political correctness, but how about an amendment clarifying that what a person says isn’t illegal simply because someone else doesn’t want to hear it? Is it possible to even legislate offensiveness without that legislation itself being offensive? I think that’s it. But what about you? Do you have other amendments you’d like to see? Or do you disagree with any of mine? Comments are welcome as long as they’re made respectfully. Why Do I Live Here…Now? Have you ever wondered why you born to the parents who conceived you or why you were born at this point in time? And why you were born and reared in the country–or perhaps even the countries–you grew up in. I do, and I also wonder about my birth parents–who they were and where they were from. And why they were in the right place and time for my adoptive parents to take me home from the hospital. As a Christian, I believe God knew all about who and where I was going to be, even before He created the world. So it’s no accident–nor is it fate or luck–that made me an American in the perilous, yet very exciting times we live in. God could’ve targeted me for Old Testament times. In fact, if He’d wanted, He could’ve made me Jewish. He could even have made me one of the twelve brothers the tribes of Judaism originated with. Interesting thought. I hope I wouldn’t have been one of the brothers who was so jealous of Joseph. Or what if God had made me Joseph? Too much to think about! Living in the Holy Land during Jesus’s earthly life would’ve been great. Surely I would’ve been one of His disciples. Uh, or would I have been one of the scribes and Pharisees He spoke so harshly of? Would I have been one of the men crucified on either side of Jesus? Oh, no! What if I’d been Judas? I’m not a history buff, but I’ve studied enough to believe there’s never been a perfect time in all of recorded history. (Not since the Garden of Eden, that is.) Every era has had its dangers, its villains and its heroes, and one or more nations wanting to be in control…or to wipe everyone else out. I’m not sorry to be living in America in 2017 in spite of threats from North Korea…and from liberals who don’t appreciate what America stands for…and from the elected officials who don’t give a rip about about what “We the People” want. As long as I look at the numerous advantages I have, how can I dare to complain? For whatever reason–He’s not required to tell me what it is–God chose to put me here at this point in time. Who knows? Maybe He even intended for me to make a difference, no matter how small. What a wonderful reason to be alive now! 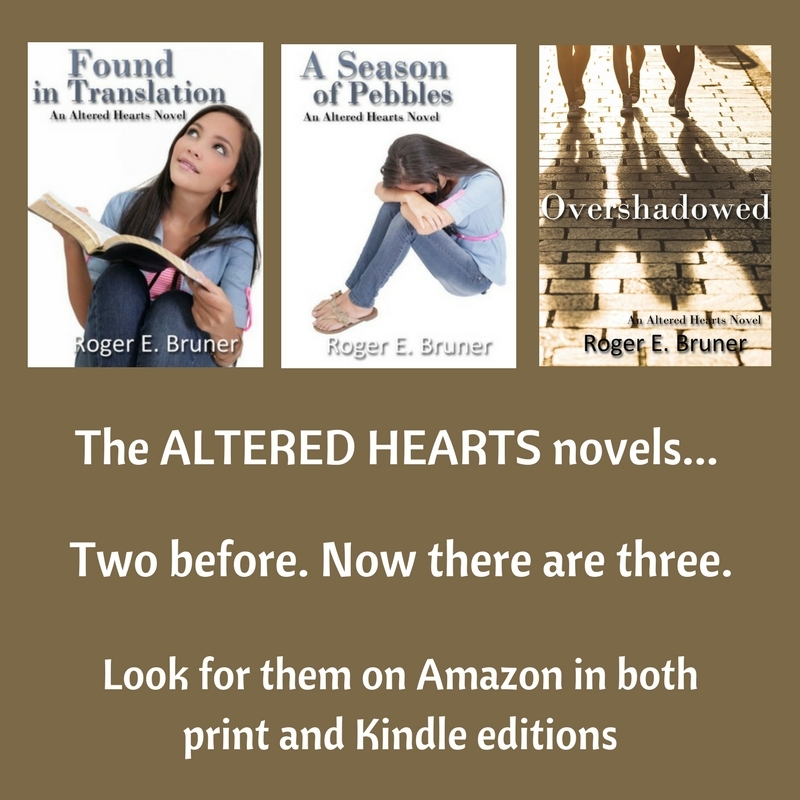 In the graphic below, please note that I need advance review copy readers for the final book in the Altered Hearts series. 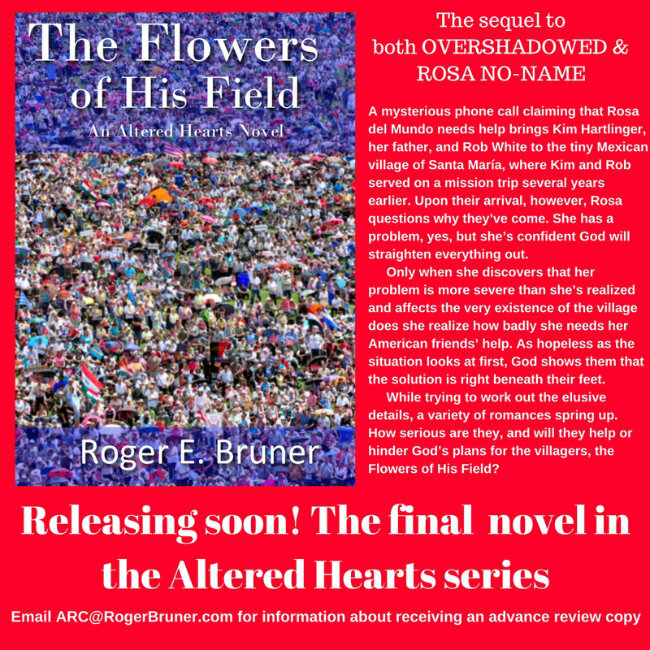 Even if you don’t have time to read and review THE FLOWERS OF HIS FIELD by the time it comes out next month, I’ll still be happy to send you an e-copy. Although you’re not committing to writing a review–I’m not permitted to require that–an honest review would be helpful. New books rise or fall because of good reviews…or the lack of reviews. When it comes to me and the use of social media, some people might actually accuse me of being anti-social. I don’t believe that’s accurate, however. Not only have I made a number of new friends on Facebook and Twitter, I’ve also renewed old friendships that way. I couldn’t tell you the number of former English students I’ve enjoyed catching up with on Facebook. I know some of them feel strange addressing me by my first name now–one fellow is so respectful I’ve just about given up on convincing him I really want him to–but at this age (I turned seventy-one yesterday) my old students and I aren’t that far apart in age. One of my most interesting former student reconnections is with Tom, who now lives and operates his own restaurant in Colombia. I’ve also become friends again with an old friend from high school. Who would’ve thought she’d end up living in Richmond when we’d been in high school together in Norfolk? Or that she’d become one of the most enthusiastic supporters of both my writing and my music? My wife and I enjoy getting together with her periodically for a meal out. And who would’ve thought I’d find another old friend–this young lady from one of my previous work places–who was at that time living in Brazil and had written her first novel? 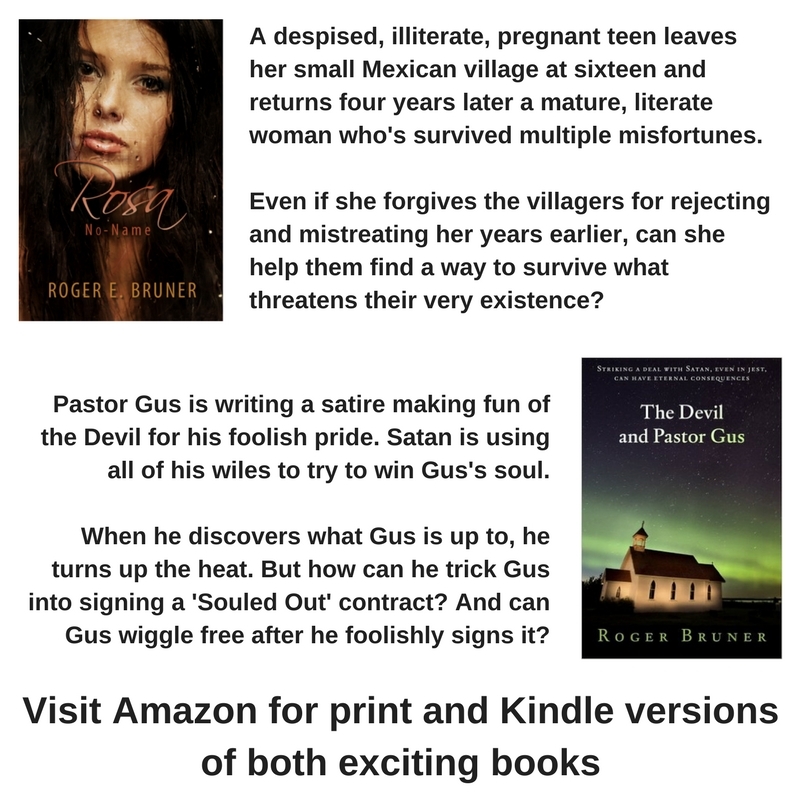 When I asked her to email a copy of it, my wife and I both love it so much I connected her with my original publisher; she ended up with a three-book contract. Yes, the original book was long enough to cut into three shorter books! Probably most of my Facebook friends are fellow authors I’ve met at conferences. But I have been blessed to meet some of my readers on Facebook, too. Truthfully, those are the people I’d most like to get to know better. One real failure on my part is not always staying up-to-date with my wonderful daughter and her terrific family. It’s certainly not lack of interest. I just can’t seem to make myself get on Facebook to see what’s going on in other people’s lives. If people post on my timeline or send me a message, I always respond. But doing Facebook just to do it isn’t my thing. I occasionally tweet blurbs about an author friend’s books and occasionally about my own. But authors are cautioned to not do too much tweeting (or Facebook posting, for that matter) about their books. So I don’t. And the easiest way to avoid that is to rarely tweet at all. I’ve met a couple of interesting people on Twitter, however. My favorite is Meggie Jenny, a Christian actress/screen writer/director/producer/you name it-er. Interestingly, she followed me first. I have no idea why. I admire her tremendously, so I’m careful not to bug her. And with that kind of relationship, I can count on her to tweet back. I have Instagram, LinkedIn, and Pinterest accounts. I rarely pay attention to Pinterest, although it’s amazing how many times people have re-posted some of my pictures from a tour my wife and I took of the Martin Guitar factory a few years ago. Although my blog posts automatically go to Twitter, Facebook, and LinkedIn, I’ve never figured out what to do with LinkedIn and I don’t need one more app on my phone to really take advantage of Instagram. The thing is, I really do like people. Even though I enjoyed the solitude of computer programing for a number of years, now that I’m retired and spending all day at home writing while my wife is out making a living, I find that I do miss people. Walking at the mall in the early morning gives me some vital human contact, but–no matter how it might pain me to say so–so does my limited participation on social media. But social media is far from being an addiction for me, and that’s a good thing, too. What about you? Are you a media addict or do you use it reasonably…or not at all? Your comments are welcome. All too frequently I wake up to find I have a new ache or pain. Sometimes it goes away. Sometimes it doesn’t. Why should that surprise me? I’m seventy now. I’ll turn seventy-one this coming Saturday. While I’m not nearly as old as I hope God will permit me to become before I die, I have no choice but to either accept the fact that my body has been deteriorating since birth or hold a pity party I won’t invite anyone else to because I know nobody wants or needs to listen to me complain. Fortunately, my mind still seems to be in reasonably good condition. I say “reasonably” because, like many of my younger peers, I catch myself forgetting more and more of those everyday words none of us can live without. So far I only forget familiar people’s names when I’m not with them, but I anticipate the day that will change. Being the best I can be? That sounds like a real challenge since the best possible seems to be shrinking beyond my ability to control. What does “being the best I can be” really mean, anyhw? I’ve come to a definite conclusion. Whatever I may be good at, being the best I can be doesn’t involve comparing myself with other people. It has to do with using what I am and what I have in a way that pleases God. The fact that I’m not the best guitarist or bass guitar player in the world isn’t important. Or the best novelist. I haven’t made it to the New York Times best seller list yet and don’t expect to. What matters is my willingness–my desire–to use my talents in a godly way. If I’m able to do my best playing bass for the worship services and Christmas musical, if I’m willing to do my best providing a guitar accompaniment and doing a weekly solo at the nursing home ministry, I should be pleased. Neither do I need to become a best-selling author. 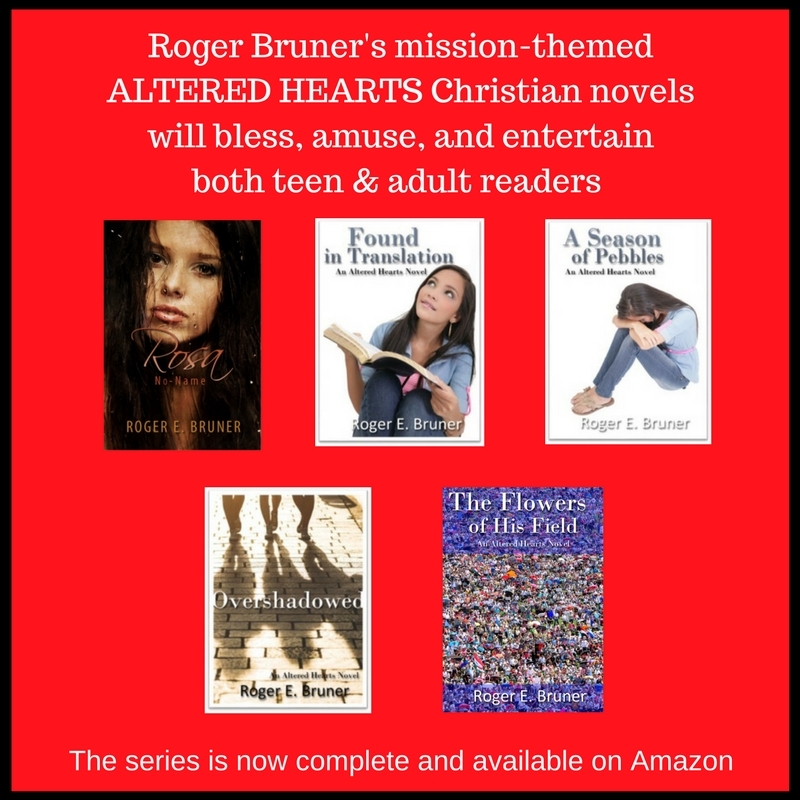 If I write the books God inspires me to write, if He helps me to publish the ones He wants published, if the people He wants to buy and read them and get from them what He wants them to get, I should be thrilled. Perhaps it’s time to measure “the best I can be” in a different way. Not from the limited way I view my own talents and abilities, but from knowing God gave them to me for a reason. He wants me to use them for Him. I treasure the sayings, “I’m a work in progress” and “God’s not finished with me yet.” I’ll never be the very best I can be in any area of my life until He has finished with me. And that won’t happen until I come home to Heaven. Better to hope for His “Well done, good and faithful servant” than to fret about my shortcomings and inconsistencies here on earth. As long as I’m honestly trying to let Him make me a better person–the best person I can be–He’ll use whatever talents I have in whatever way He desires. What more can I ask for than that? If you’re ever on Interstate 95 going through Richmond, Virginia, and looking for gas, you can take exit 86A towards Atlee and find a reasonably priced Sheets station a mile or two up the road. Or take exit 86B towards Elmont for an equally reasonable Wawa station that’s probably a little closer. The right-hand picture above shows Wawa’s sign; the station itself is much more visible. Almost within spitting distance is a little BP station–you’ll recognize it as a former 7/Eleven store–that’s usually just a penny or so more expensive than Wawa and Sheets. But heaven help you if you are on Rt. 295 getting off at the Rt. 1 exit going north towards Ashland. You’ll eventually come to the Shell station pictured on the left above. Even though it appears to be the only one in that neighborhood, the Wawa and BP stations are actually only a couple of miles further. But if you’re like us, you probably don’t want to drive additional miles to gas up when traveling, even if you know other choices exist further up the road. You want to get back on the road. If you haven’t clicked yet to look at larger versions of those two pictures, you might want to do so now. Did you notice the difference in gas prices? 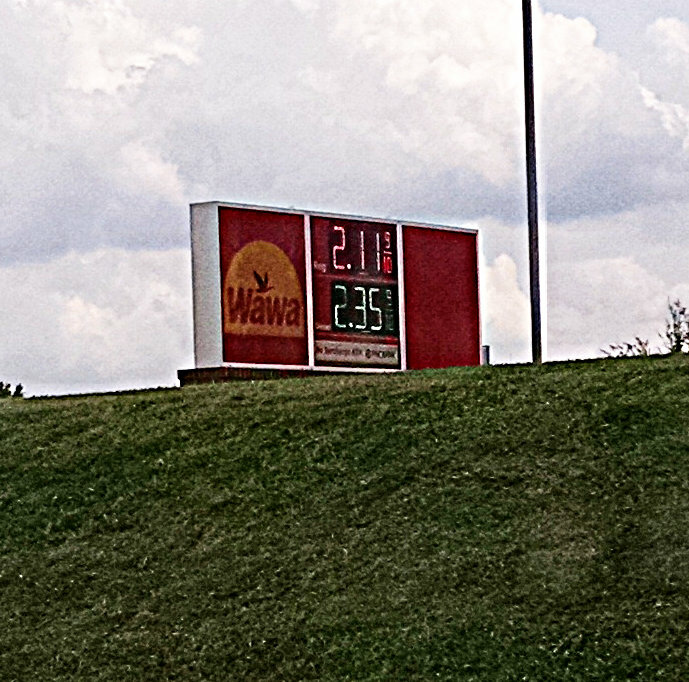 $2.11.9 for regular at the Wawa and $2.79.9 at the Shell! That’s a sixty-eight cent difference. 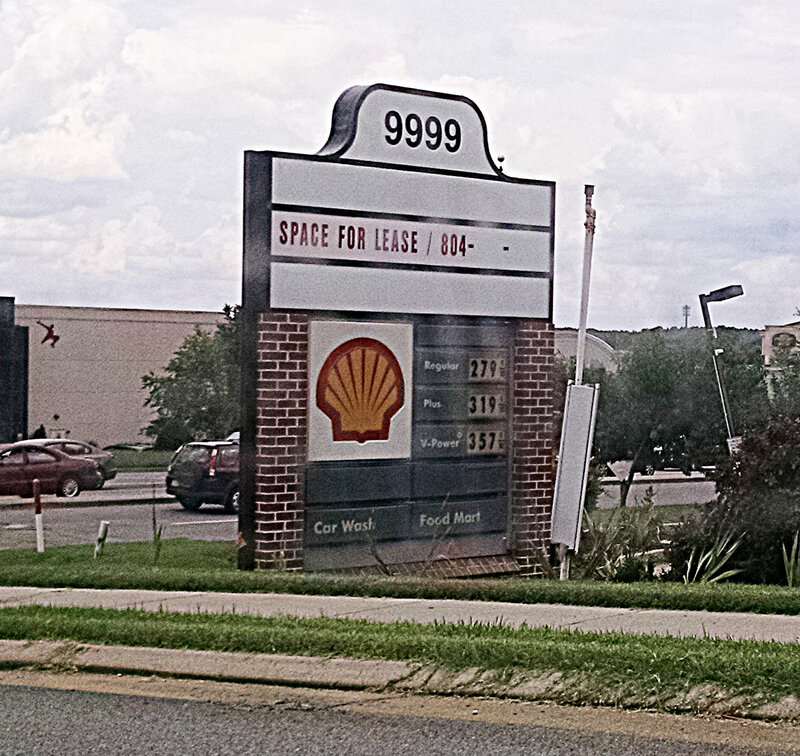 I doubt seriously whether the Shell station gets much business from us locals. And no wonder. If I waited to get gas until the fuel gauge told me I really needed to, I would spend at least $6.80 more than I would at Wawa, Sheets, or even the little BP station. My wife and I periodically take road trips, and I’m always thrilled that my Honda Civic that only gets 25-28 mpg in city driving makes it up to 45 mpg on the highway. Even so, I don’t want to pay more for gas than I have to. I could be wrong, but I doubt seriously that I’ve ever been charged unreasonably at a highway-accessible gas station. Hmm. Maybe because of competition? And the Shell station doesn’t really have any competition. Or at least it appears not to. I feel so sorry for travelers who stop at the Shell station. Not just because paying that much more for gas than they should might be hard on peoples’ budgets, but because I hate the thought that their only memory of Richmond might be the way they got fleeced by somebody’s greed. I’d be embarrassed to be that greedy. And to know I’d angered and frustrated numerous other people because of it.